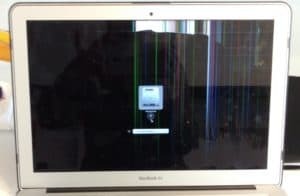 If you have colored stripes and lines going from the top to the bottom of your MacBook Air screen like this computer, it’s likely a cracked LCD. Even minor drops and pressure can cause damage to the LCD panel on these super-thin screens. Even if you don’t see a visible crack, the telltale lines on the display are a clear sign of a bad LCD screen. Luckily, we can fix this issue and get the computer back to you in a reasonable time period and for a reasonable price.